Who can resist a DIVA? From their demeanor to their talent to their wardrobe, I always keep up with my girls. I'm so glad to have the opportunity to interview Billy Lykken who is returning to the Metropolitan Room during NYC Gay Pride weekend for an encore presentation of his show Lykken 'The Sacred Monster' Live, which is an alt-cabaret experience featuring Billy's queer brand of comedy and outrageous parody, as well as his interpretations of songs ranging from Broadway, R&B, Jazz, and Tin Pan Alley. 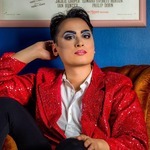 Billy takes his audiences on a hyper-emotional journey of song, eyelash, and pizzazz filtered through the soul of an often heartbroken, but never bitter, sequined songstress whose eccentricities and self-destructive behavior are overshadowed by an all-consuming need to please the faithful masses. Lykken 'The Sacred Monster' Live will play The Metropolitan Room on Saturday, June 24 at 4pm! Click here for tickets! For more on Billy be sure to follow him on Facebook, Twitter, and Instagram! 1. Who or what inspired you to become a performer? Judy, Liza, Barbra, Bette, these are names I can't forget! My favorite albums growing up were live diva concerts, Barbra Streisand - A Happening in Central Park, Patti Labelle Live at the Apollo, Judy at Carnegie Hall of course. Honey, I wore them out! I think I was attracted to their larger than life personas and a hyper-emotional way of singing. I would lip-sync to them in my bedroom and sort of become them in my fantasy. So that's what this show is, me acting out my childhood fantasy and letting my inner diva out. Billy Lykken2. This June, for Gay Pride weekend, you are returning to the Metropolitan Room for an encore performance of your show Lykken 'The Sacred Monster' Live. What are you looking forward to most about performing during Gay Pride Weekend in NYC? I'm singing my version of Nina Simone's "Mississippi Goddam." Talk about a Sacred Monster! This year's Pride is different for me, and I think it's different for most LGBTQ people. I'm angry, afraid, energized, amused. It's my protest song but with a funny twist, and it's cathartic. 3. Why do you call yourself the "Sacred Monster"? "Sacred Monster” is an old term for an eccentric diva who's maybe a bit "too much" or a little needy, but is so talented and electrifying that it just adds to the mystique for her worshipping fans. The character I play is sort of delusional about her own legend. It's tongue in cheek, but at the end of the day I want make you laugh, and cry, and walk out feeling like something happened to you. 4. In this show you take the audience on a hyper-emotional journey of song, eyelash, and pizzazz filtered through the soul of an often heartbroken, but never bitter, sequined songstress whose eccentricities and self-destructive behavior are overshadowed by an all-consuming need to please the faithful masses. What has been your most hyper-emotional life moment thus far? Working that stage at Metropolitan Room! I throw down like my sacred monster mothers taught me. Billy Lykken5. Why are you often heartbroken, but never bitter? All artists are vulnerable people because they have to be. It's a curse and an asset. I find bitter people are not vulnerable. 6. What do you think is your biggest eccentricity? I get obsessed with things, or people. Like if I see some Liza Minnelli performance on Youtube that I love, I'll watch it a hundred times, and memorize every moment. Or I'll start on some hobby, like baking bread. I'll bake a million loaves of bread and then just stop one day and drop it completely. 7. With your eyelashes and sequins on, what has been your flashiest, most diva inspiring moment? I have crazy bolero arrangement of "My Way" that I used to do. It's a self-congratulatory, presumptuous song to sing in the first place. Perfect for a Sacred Monster. Come to think of it, maybe I'll put it back in the show. Billy Lykken8. When you are in your dressing room before the show, as you are putting your make-up on, what is going through your head? And after the show, what goes through your head when you take your make-up off? As I'm putting my makeup on I'm trying to get into the feeling of the character, looking in the mirror giving fierce face and saying "Yaaaas I look fabulous." She's a legend in her own mind and I want to tap into that energy before I hit the stage. I'm not a flashy person in real life so the makeup and sequins help me get there. The show takes a lot of energy, so I think I must seem like an insane person when people meet me after because my whole body is still buzzing. I can't just drop it when I get offstage. 9. Your performance has been compared to the likes of Tallulah Bankhead and Eartha Kitt. What was your reaction to this comparison? How did these two artists influence your style? Well that's a compliment and I'm humbled by that because those women were geniuses and goddesses to me and certainly did influence the show. I sing Eartha's Japanese version of "Come-on-a My House" and it's outrageous! Do you know she sang in seven languages? French, Hebrew, Tagalog. And Tallulah had that hilarious deadpan humor and wit. And an underrated actress too, watch Lifeboat. 10. On "Call Me Adam" I have a section called One Percent Better, where through my own fitness commitment, I try to encourage people to improve their own life by one percent every day. What is something in your life that you want to improve by one percent better every day? I sing everyday because it makes me happy and I can feel myself getting better at it all the time. Repetition baby!